Bright Week or Renewal Week (in Greek: Διακαινήσιμος εβδομάδα, Diakainisimos) is the first week following the Resurrection of Our Lord and Savior Jesus Christ, which is celebrated each year at Pascha. It ends the following Sunday, the Sunday of St. Thomas. For Orthodox Christians Bright Week begins a period of celebration that continues for fifty days until Pentecost. This celebration includes the practice of the faithful joyously greeting each other with the salutation of Christ is risen, followed by the response indeed He is risen or truly He is risen, as the whole of creation is renewed by Our Lord and Savior. The services of Bright Week are done with the Royal Doors fully open. This unblocked view of the altar symbolizes the open door of Christ's empty tomb as well as the rent veil of the Jewish Temple, which was torn apart at the moment Christ died. The entire week is considered to be one continuous day and the main reason why fasting is completely prohibited to all Orthodox during the week. If it is necessary to conduct a funeral during Bright Week, this service follows the format for Paschal Matins, with only a few funeral hymns being chanted. 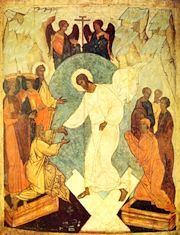 It is held that those Orthodox Christians who die in penitence during this time are released from the bonds of their sins and are accepted into the Kingdom of Heaven. ↑ fasting is also prohibited during Bright Week so that the faithful may recover their strength after the eight weeks of fasting for Great Lent and Holy Week. This page was last edited on May 15, 2011, at 03:11. This page has been accessed 37,787 times.